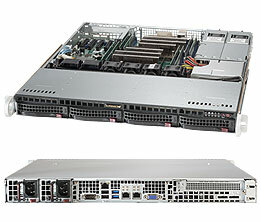 With 12.8 Gbps switching capacity, the ECS3510-28T delivers wire-speed switching performance on all Gigabit ports, allowing users to take full advantage of existing high-performance, Gigabit integrated servers, PCs and laptops by significantly improving the responsiveness of applications and file transfer times. The device also has four Gigabit Ethernet combination ports for uplink flexibility, allowing copper or fiber uplinks to servers or the network backbone. IEEE 802.1s Multiple Spanning Tree Protocol runs STP per VLAN base, providing Layer 2 load sharing on redundant links. Multicast VLAN Registration (MVR) is designed for applications such as Media-on-Demand that sends multicast traffic across an Ethernet network. Support for IEEE 802.1Q-in-Q VLAN tags expands the VLAN space by double tagging packets. Port Security ensures access to switch ports based on MAC address, limits the total number of devices from using a switch port, and protects against MAC flooding attacks. IEEE 802.1X port-based or MAC-based access control ensures all users are authorized before being granted access to the network. User authentication is carried out using any standard-based RADIUS server, with support for dynamic VLAN assignment and a guest VLAN. Secure Shell (SSH) and Secure Sockets Layer (SSL/HTTPS) encrypts Telnet and web access to the switch, providing secure network management. TACACS+ 3.0 authentication for applications, such as network access or IP mobility, enables centralized control of the switch and prevents unauthorized users from altering the switch configuration. Private VLANs isolate edge ports to ensure user privacy. An industry-standard command-line interface (CLI), accessed through the console port or Telnet, provides a convenient way to configure and troubleshoot the switch. DHCP snooping provides security by filtering un-trusted DHCP messages and by building and maintaining a DHCP snooping binding table. If you run out of ACLs, IP Source Guard can be enabled on a trunk port with a large number of VLANs that have DHCP snooping enabled. DHCP Option 82 is a feature that adds device information to client TCP/IP configuration requests, which are relayed to a DHCP server.